The first mask we all know and love is of course Jacques Plante’s original face-hugging mask, the first “full” mask of its kind. 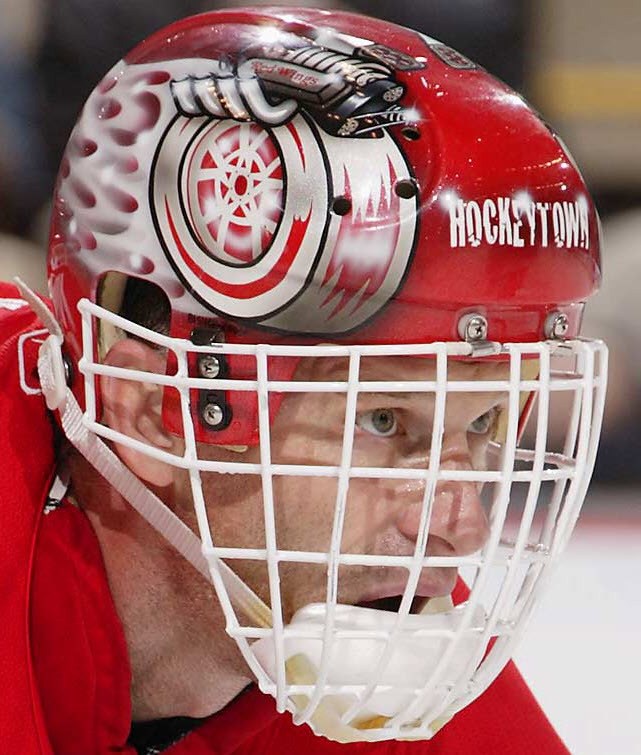 Even though it’s the first “full” face mask, it isn’t the first time a goalie has worn face protection. In 1927, a goalie for Queen’s University is reported to have worn a fencing mask. 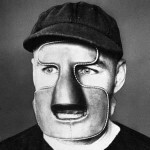 A leather “nose gaurd” was worn by Clint Benedict (Ottawa Senators/Montreal Maroons) in 1930 to protect a broken nose, but he never wore it again after recovering. Teiji Honma, a Japanese Olympic goalie, wore something similar to a baseball catcher to protect his large eye glasses from the puck in 1936. Of course on November 1st 1959, Jacques Plante took a shot to the face against the Rangers, and donned his famous fiberglass mask. Did you know that Plante went on a winning streak after regularly wearing his mask? I wonder why that is. He actually broke the streak when he was asked not to wear the mask for a game and lost. This is a pretty clear depiction that fiberglass masks needed to be the new standard. The mask gave goalies that much more protection and that much more bravery to stop the puck. I know I would NEVER get in the crease without my mask. You couldn’t pay me enough money to even take one or two shots without my mask. The speed the puck travels these days is practically deadly to receive one square in the melon. The last crazy goalie was Andy Brown (Red wings/Penguins) whom played his last game in 1974, without a mask. The face-hugging fiberglass mask didn’t last very long, and many improvements and design changes were made over the years, with different straps, materials, thickness, shapes etc. One interesting note is how goalies even then had to personalize some equipment. Back then there were no colorized pads or sticks, but what they could paint were there masks. Actually, there are quite a few really interesting face-hugging masks, my favorite being Gilles Gratton’s Lion mask in the 70s. The helmet/cage combination came into effect in the early 70s, with well-known Russian Vladislav Tretiak sporting it for his famous Summit series and Miracle on Ice appearances. 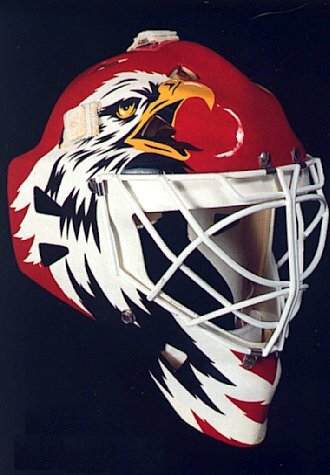 His mask featured the standard player’s helmet with a full bird-cage style face mask. This was actually the most popular choice for a while until of course the modern style mask came about in the early 80’s. The modern mask has come a long way since it first started, but just like the face-hugging masks, it was and still is pretty clear this was the road goalie masks needed to take. The new shape and design was a tad heavier, but provided very solid protection and contact dispersion. Due to its shape the puck could now glance off of a goalie rather than hit him dead center with full force. 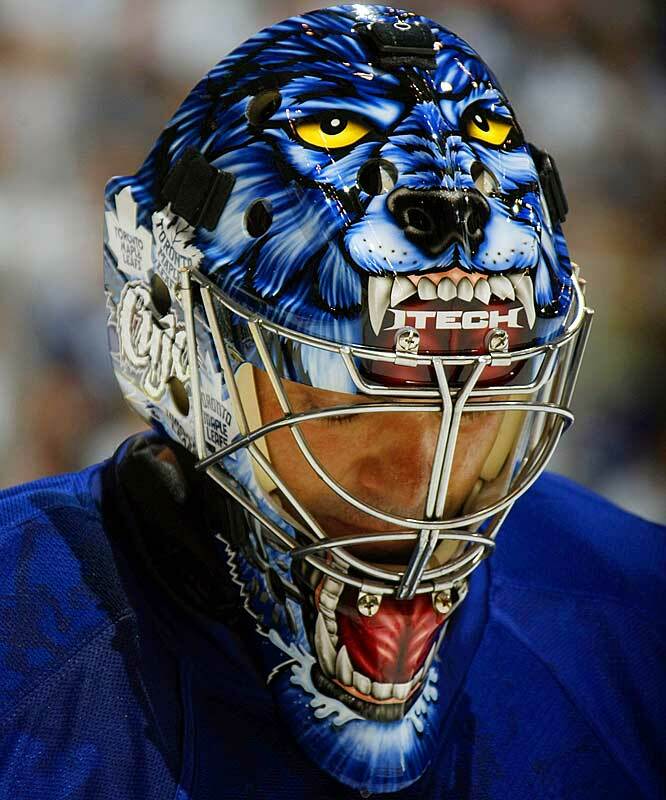 Some of the last goalies to not wear this style of mask were Dominic Hasek, and Kelly Hrudey, both well known goalies (or TV personalities). Today we see masks that still look the same as they did before, with a very similar shape that is effective at protecting the goalie, however it’s a change of materials that has evolved the mask further. Outer shells are made with Carbon Fiber, Fiberglass or Kevlar, or different mixes. Inner materials have done away with foam and velcro for molded and scientifically placed/designed gel and padding inserts, designed to absorb large shocks from pucks, and anything else that hits us goalies. The most distinctive part of these masks of course is the huge outer shell space. Anybody who steps into the crease either has or really wants a custom painted mask. All of our favorite goalies have some very intricate, albeit expensive, designs put onto their brand new masks. There have been hundreds of goalie masks in the NHL that we can all remember, such as Ed Belfour’s and Curtis Jospehs very memorable masks. Without getting too in depth (An article is in the future about this, don’t worry), it seems paint jobs are some of the most important parts of the mask, and definitely gives a little extra flair and personality to the position, but not much functionality past how the helmet is fabricated. The function of the goalie mask has always remained the same, and it’s basically the most important piece of protection that you have as a goalie. Could you imagine being those goalies back then taking shots without any facial protection? Like I mentioned I would never put on the pads without my mask. I have talked a lot about the evolution of goal tending and styles (See the articles! ), and it’s no question the masked helped it along. Without the fear of injury, goalies could freely drop to their knees to make more effective saves, and have no fear of coming out of the crease to aggressively challenge shots. That means without the masks we have, there would be no butterfly style. I’d say that makes it pretty pivotal in the whole evolution. The last thing to remember here is that it’s still a safety precaution, and it does not completely avoid danger. Some shots still can cause some minor injuries, and strong contact with players, the ice and even the crossbar (Yes, I’ve taken a shot from the crossbar…) can also cause not just minor but major injuries. It’s important to keep yourself aware of any possible dangers and try to avoid them. Players that crash the net can GO TO HE-kidding. But really, it’s important to be wearing the appropriate mask for the play you are going to get involved in, and to never be shy on spending a little extra to get that perfect mask. Head injuries aren’t common for us goalies, but they do happen, and when they do they’re never pretty. Remember there’s more than netting between you’re pipes. Nice blog, totally true about taking shots from the crossbar… that is how i ended my career. got charged, helmet got knocked off and back of my skull hit the bar cracking the back of my noggin. invest in a great, good fitting helmet! best thing you can buy, as one bad play can end your time on the ice.